I covered the first part of when my sister came to stay in this post, so you can catch up there if you like! The day after our York trip, you'd think we were fed up of food... Nope! We headed into Leeds to do some more shopping and to eat of course! We did wonder about visiting Trinity Kitchen, but the sheer amount of choice was a bit overwhelming, so we headed to Handmade Burger Co as Nat had a real hankering for a burger. What a decision. I had never been there before as it is situated right next to Yo Sushi, which is one of my favourite ever places to eat, so Yo Sushi had always won in the past. We were seated straight away, and asked if we had ever been before. As we were both new to the place, the waitress explained the menu to us, and told us that once we had decided, we should go order and pay at the counter. It is Nandos style service, even down to the help yourself unlimited soft drinks. The menu looked so good, with so many viable options on it, we spent far too long perusing and trying to decide what to have. 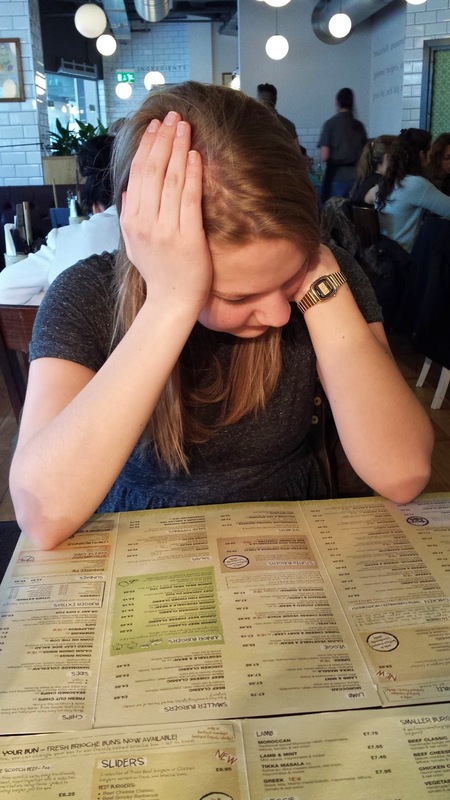 Eventually we settled on a choice each and went to the counter to order. During the wait for our food, we saw what other tables were having and it all looked amazing. I don't think I have ever anticipated a meal so much after seeing what else was coming out of the kitchen! There were proper looking shakes in the metal containers, and amazing looking burgers a plenty. The coleslaw came in the biggest bowl I have ever seen, and the chips looked so good. I think we were both seriously salivating by the time our order arrived! Doesn't my burger just make you want to lick the screen? Just me? 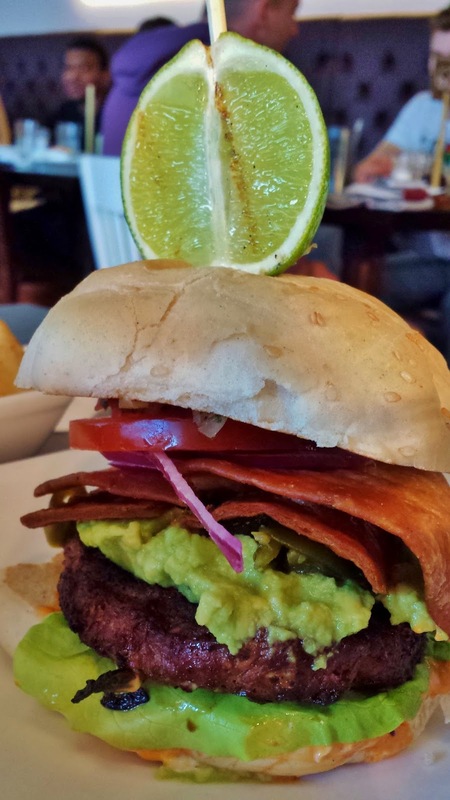 I had the mexican burger, which had salsa, crushed avocado, jalapenos, chipolate sauce and homemade tortilla chips on it, as well as the standard 7oz beef patty, red onion, lettuce and tomato. It also had half a lime on top to squeeze over it which I thought was a nice touch. Certainly made it look impressive! I didn't manage to get a good photo of Nat's burger, you can just about see it in the picture above, but she had the peppered beef if you're interested, and she was full of nothing but compliments about it. 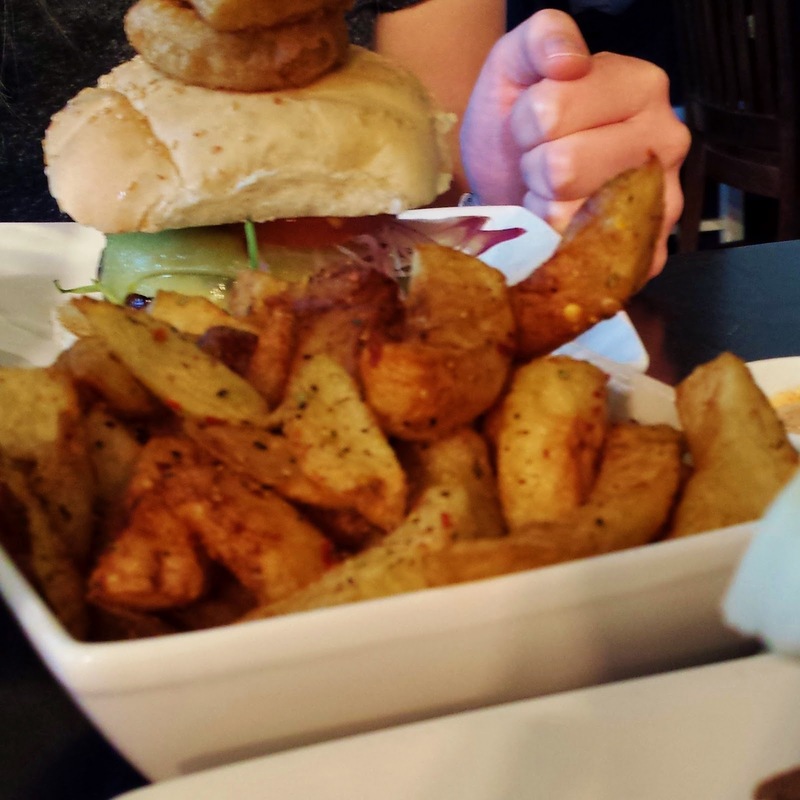 Nat's burger came with onion rings on top, and she kindly let me swipe one. It had crispy batter, with a good onion to batter ratio, they were lovely. We shared a portion of peri peri chips, which were some of the best chips I have ever eaten in my life, and nicely spiced, with just the right amount of heat. We also opted for blue cheese mayo and cajun mayo as sides. The cajun mayo was spicy and creamy, as to be expected, but the blue cheese mayo was amazing. It had huge chunks of blue cheese in it, and it went superbly with the chips, probably not the one to have if you're not a huge blue cheese fan though. We were both massively stuffed at the end of the meal, and neither of us could even contemplate the thought of dessert! 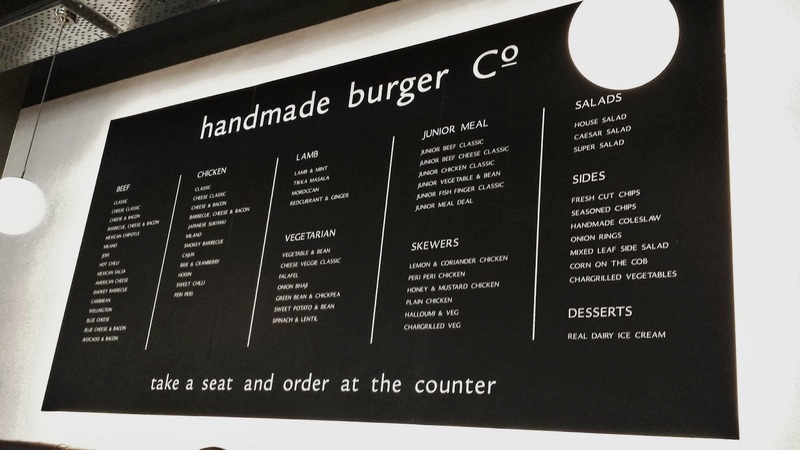 I would highly recommend Homemade Burger Co for any burger lovers, and I know I will be going back again to try out some of their lamb and chicken burgers, and to devour more of those fantastic chips. We managed to waddle our way back to the train and my sister headed home after a very fun and food packed two days. This post isn't sponsored in any way, I will always state on this blog if something has been gifted for the purpose of review, I just had an amazing meal, and have been raving about it to everyone I know, and now this includes you lovely lot!